"K" - Chapter 5: "All-American"
Superman fights the All-American Boy in a battle that takes them to the streets of Smallville. The fight frees Batman, who was nearly unmasked by Amanda Waller. The Last Line tries to stop him but Batman convinces their leader, Brannon, to help him stop the All-American Boy and Waller. The destruction in Smallville leads to the Kent Farm and Batman soon arrives to give Superman a hand. His actions only serve to slow All-American Boy down, which was his intention from the start. The military arrives with the Boy's parents, who are able to talk the mutated soldier down. Waller tries to arrest Superman and Batman once more, but Brannon refuses to help. Batman reveals the evidence that Josh Walker, the soldier who became All-American Boy, was duped into the experiment and the Dark Knight uses that as leverage to get what they wanted. Before leaving Waller gives Superman one of their weapons, which bears the Lexcorp logo, to show the Man of Steel that despite taking her Kryptonite there is still more out there. 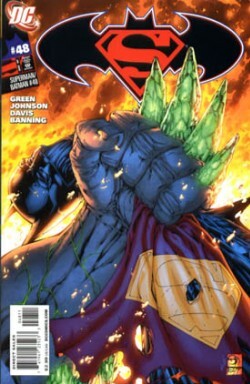 Story - 2: In this issue we have Superman fighting a Doomsday like creature through the streets of his home town and Batman getting a lecture by Amanda Waller that he and his kind are through. Green and Johnson throw in some deeper meaning by examining what make Clark Superman and what makes Bruce Batman. Themes are explored and characterization is presented to reinforce those themes. And it was all utter crap. I felt nothing for any of these characters, even Superman and Batman. So the Doomsday guy is just an all-American boy who was lied to by the government and turned into a monster. He's also from Kansas, so he's a lot like Superman, right? Two men doing battle who have so much in common. And in the end the All-American Boy's rampage is halted because his parents help him to remember his humanity. Oh wait, there's also Batman getting the "you people" talk from Amanda Waller, who is tired of heroes running around in masks and after all is said and done and Batman gives Amanda the "I'm Batman" look we have Bruce and Clark sitting down to dinner with the Kents. Sure there were some bright spots. I liked the bit where Clark remembers working at the gas station and Lana coming around to hang out. That was a nice little throwaway memory but it strikes to the heart of what I hated about this issue. Everything was there to make you feel something but presented in such a way that lets you see the separate pieces instead of blending them together as a whole. It seemed like they were trying too hard and beating us to death with pathos. If this is Green and Johnson's style that's fine but I just don't care for it. This is the most bizarre story arc ever. It doesn't even feel like a story arc really, just a couple of random stories with the over arcing sub-plot of Superman getting rid of all of the Kryptonite on Earth. Apparently there is a conclusion next month but I am not quite sure what they are concluding since the end of this issue felt like the end of an arc. It's not that they're terrible writers but someone needs to sit these people down and show them how to break a six issue story arc. Art - 4: There was a lot of wholesale destruction in this issue and I have to admit that Davis and Banning handled it rather well. The writing was heavy handed but the art nearly saved it, S on the belt and all. Cover Art - 3: Not a bad cover. A very boring cover, but not a bad cover. I think they were going for a shock factor with Doomsday clutching Superman and Batman's capes and to me, as the jaded fan, I find that rather banal. Oh wait. He has Kryptonite in his bony protrusions. That makes it better.